So you probably know by now that I do not consider myself a crafty person. Mainly because I don’t do things “correctly” nor could I hope to ever sell a creation of mine. However, I’m beginning to realize that there’s more to it than that. I’m creative and I like figuring out how to make something my girls ask for without any guidance or blueprints. Does the finished product look amazing? No, by any means. But I’m usually proud of the process and how I got a solution and I’m beginning to realize that that is an important lesson for my kids. Using what you have, trying different things out, starting over when it doesn’t work: these are all things I’m glad I know how to do as an adult and things that I want Lucy to know how to do. Lucy has been getting into the idea of mail lately. We made and sent valentines last week and she thought it was so cool that they were delivered to her friends and family. She also got valentines, has a magazine subscription, and gets the occasional card or invitation in the mail that she loves opening. So I thought we’d make a mailbox for her to put on her bedroom door and one for her sister, Alice. I had no idea what I was doing. 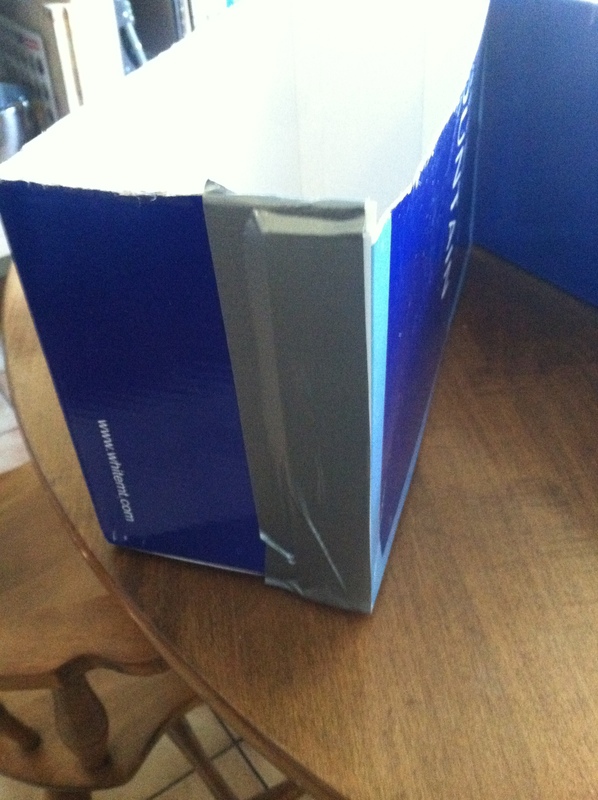 I just knew it had to be a smaller box that could open like our mailbox (a hinged lid on top). So I gathered a big shoebox, some construction paper, some mailing tape, a scissors, some glue, and some duct tape and got to work. I figured I’d do the bulk of the construction while the girls napped so they could get right to work decorating when they woke up. 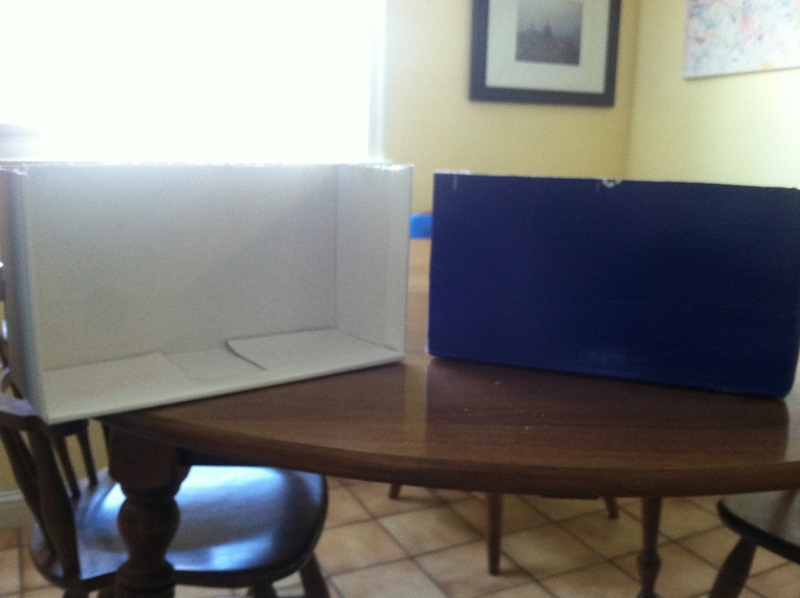 I cut the big shoe box (one we got boots in) in half as well as its lid then started taping each half lid to its half box, leaving an opening at the top for a proper mailbox lid. In need of a suitable cardboard something to use as a lid, I began perusing the house. 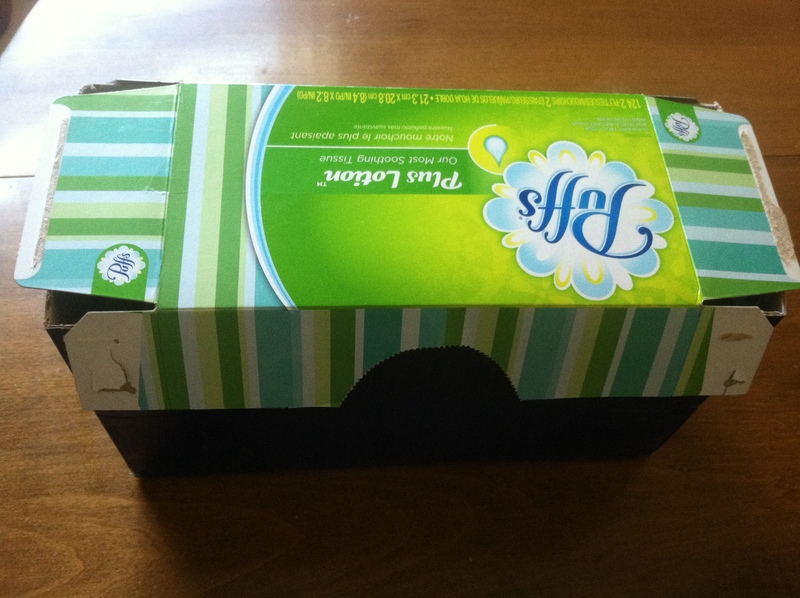 I looked in our recycling and after testing out quite a few different box types (cereal, cracker, even another shoe box) but found the trusty kleenex box to be what I needed as it was the right size and bent in the right places. I then taped, taped, taped so that everything would be sturdy and fairly straight. I’m sure there’s a better craft product that would have done a better job but all I had was duct tape and mailing tape. Then I went to work taping down some construction paper to give Lucy a blank slate to decorate when whe woke up. I used tan colored paper, leaving as much of the paper exposed as I could in case she wanted to glue things on (which she did-can you blame her?). 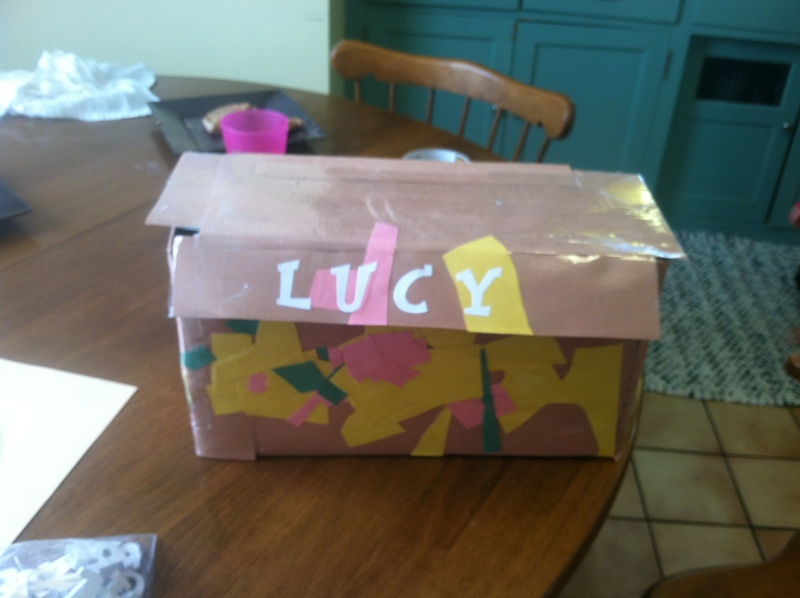 She was so excited about this project and decided to cut up pieces of colored paper and glue them on to her box. She went at it with gusto for almost an hour while I worked on Alice’s box while trying to entertain Alice fresh from her nap. When Lucy was done gluing, I put a fresh layer of clear mailing tape over so that she could add stickers at a later date, if she wanted, and also glued down the letters of her name (one of the few crafty things I’ve purchased is a pack of paper letters from Michael’s for under $5 that I use A LOT). I’m sure Mod Podge would have done a better job but I don’t have any. Here’s her cute box. It’s a little crooked and doesn’t close all the way but it’s hers and she was so impressed that I made it for her and she was able to make it her own. She’s talked about little else since then. We just have to decide where exactly to put both boxes. She’s already made a card to put in Alice’s box for her first bit of mail and I’ll write a card today and put it in there for whenever she opens it next. I’ll also be looking for some stickers that look like stamps she can use to mail her items. A very cold day, some things I found lying around the house, and a little creativity provided some great entertainment for us. Would I find this box on Pinterest? No, but Lucy adores it all the same. What have you created or figured out on your own? Do share!